Two new ICON courses have been developed by EHS staff and are now required, as specified below. In addition, two courses which were previously recommended for laboratory staff are also now required as part of the general safety training coursework. Biohazardous Waste - W524HZ: all laboratory staff and other non-lab staff that generates and/or handles biohazardous waste tubs. EHS is requiring the completion of this course by the indicated audience due to recurring problems related to packaging, labeling and pick-up of biohazardous waste that affect the UI’s compliance with Department of Transportation requirements. Radiation Awareness for Labs – W528RD: all individuals working in a laboratory actively registered for radioactive materials who are not listed on the radiation permit. This course requirement is due to a request made by the Iowa Department of Public Health. Chemical Fume Hoods – W485CM: all individuals who handle chemicals in a research lab or other work area and use a chemical fume hood to limit exposure to hazardous chemicals. This requirement is a result of deficiencies regarding the understanding of how a chemical fume hood operates, should be used, fume hood annual testing and repairs/maintenance. Advanced Biosafety – W005BO: all individuals working with biological organisms categorized as Risk Group 2 (RG2); RG2 agents are those associated with human diseases that are rarely serious and for which preventive or therapeutic interventions are often available (examples include viral vectors, S. aureus, P. aeruginosa, H. influenza). The Institutional Biosafety Committee (IBC) has determined that individuals working with RG2 agents should have an understanding of how to perform a risk assessment on the organisms and procedures that will be used in a research project and is now requiring this course for the indicated audience. The above courses will now be listed in the initial training requirements for the indicated audiences. Current laboratory staff members who have already completed the above courses are not required to repeat the training. As the safety advisors conduct their annual laboratory audits, the requirements and completion of these courses will be reviewed. Please contact your lab safety advisor with any questions. Are You Labeling Your ABSL1 rDNA Animals with the New Grey Cage Card? In March, the IBC informed the research community of changes to the requirements for disposing of ABSL1 waste generated by animals that have been inoculated with rDNA or synthetic nucleic acids that are not exempt from the NIH Guidelines. These changes affect waste handling by research and Office of Animal Resources (OAR) staff who change cages, as specified below. Please note: These changes do not apply to waste generated by animals inoculated with double-stranded oligos or aptamers, since such work is exempt from the NIH Guidelines. All cages/pens must be labeled to indicate that the animals they contain have been inoculated with rDNA or synthetic nucleic acids. OAR staff will coordinate the processing and disposal of waste generated from these cages/pens. Animal waste (bedding with feces and urine) must be appropriately decontaminated (see below) prior to disposal until all animals in a cage/pen are euthanized or appropriate testing has determined that the animals no longer shed the rDNA or synthetic nucleic acids with which they were inoculated. We request that, prior to initiating any shedding studies, a proposed shedding protocol be submitted to ehs-rdna@uiowa.edu for review by biosafety staff and members of the IBC to ensure that the experiments will effectively detect shedding. Upon initial inoculation, cages/pens must be labeled with a grey “ABSL-1 rDNA or synthetic nucleic acid” card (which may be obtained from OAR staff). 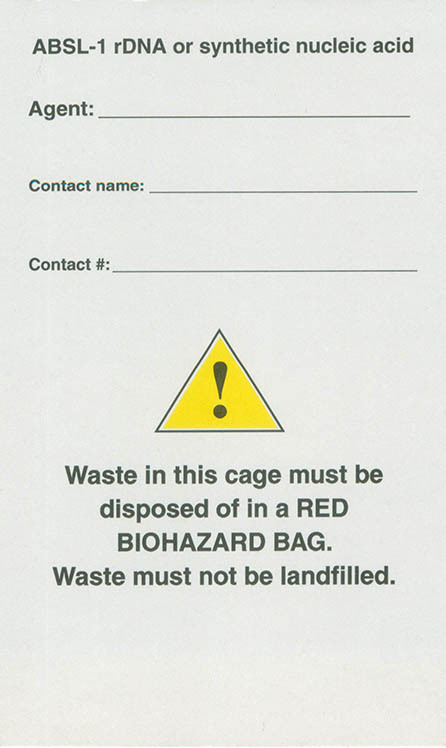 To ensure proper waste disposal, a half grey card will be placed face up in the dirty (empty) cage to inform the cage wash caretaker of possible contamination of ABSL-1 rDNA or synthetic nucleic acids in the bedding. Reconstitution/dilution of rDNA or synthetic nucleic acids is NOT permitted in OAR facilities. Used contaminated bottles/syringes must be placed in a sharps container. Please ensure you are following the procedures described above, as appropriate. For a full description of the ABSL1 handling procedures, refer to EHS’s website at: http://ehs.research.uiowa.edu/animal-biosafety-level-1. Changes that may affect the certification of your biosafety cabinet. In the near future, the certification requirements for direct-connected and canopy (a.k.a. thimble) connected Class II Type A cabinets will be changing to prohibit direct-connected Type A cabinets and require flow alarms on all canopy connections. In 2010, NSF/ANSI Standard 49 was revised to eliminate the option of direct-connected Type A cabinets and to incorporate a new alarm requirement for canopy connected Type A cabinets. After the 2010 publication, NSF made allowances for institutions for whom the investment in new alarm technology was cost prohibitive. Five years have passed, approximately 1/3 the lifespan of a BSC, since the 2010 version of NSF/ANSI 49 was published and the grace period for compliance will soon expire. Effective April 15, 2016, NSF Accredited field certifiers will no longer certify either direct-connected Type A cabinets or canopy connected Type A cabinets without alarms. If your Type A cabinet is not connected to the building exhaust, no action is required. If your canopy connected Type A cabinet is equipped with an alarm that indicates when the building exhaust is not functioning, no action is required. If your Type A cabinet has a canopy connection, but does not have an alarm or the alarm does not function, then either the canopy will need to be removed or a functional alarm installed. If your Type A cabinet is directly connected to the building exhaust, the connection must be removed. A canopy connection can be installed (provided the canopy is equipped with a functional alarm) or the cabinet can remain unconnected from the building exhaust. If you require more information on this topic please contact Josh Kieler at bio-cabinet@uiowa.edu. The EHS Environmental Programs section welcomes Zachary Beyerink to its staff. Zach is an Environmental Safety Coordinator and his primary responsibilities will be chemical, biohazardous and radioactive waste collection and management. Zach graduated from The University of Iowa in December 2014 with a BS in Human Physiology. Zach can be reached at zachary-beyerink@uiowa.edu or 335-4165. For LSC vials, is the liquid scintillation cocktail that is used listed? Waste with incomplete tags cannot be collected by EHS staff. It is necessary to complete the back of the radioactive waste tag if the waste is a liquid. If waste is aqueous, indicate pH. If the waste is a liquid scintillation cocktail – identify the brand name. Read the tag carefully. One of the most common mistakes is to mark the “External Removable Radioactive Contamination <22 dpm/cm^2” box incorrectly. If you performed a wipe of the container and it was less than 22 dpm/cm^2, then check the box “Yes". Do not overfill containers. The lid provided with dry waste containers should be easily applied to the container in order to secure the waste inside. The 1.5 gallon aqueous waste containers should not be completely filled and have several inches of open space at the top. If it is dry waste, make sure the bag inside the dry waste barrel is sealed with a zip tie, tape, or knot. Dry waste containers should not contain lead, liquids or sharps. If lead shields are being disposed of, make sure that a radioactive waste tag is provided with the lead. Perform the wipes for external contamination and properly mark the “external removable radioactive contamination <22 dpm/cm^2” box. The New Year is a good time to take stock of where things are in your life. And that includes the hazardous materials in your laboratory. These items can potentially be dangerous in the wrong hands, so regulatory bodies have increasingly required that safeguards be in place to prevent the unauthorized use or removal of these materials. In the case of radioactive materials (RAM), it has been a long-standing regulatory requirement that RAM must be secured against unauthorized access or removal. In practice, that means when an area containing RAM is unoccupied, the material (including waste) must be in a locked cabinet or room. EHS staff audits security of RAM during routine lab audits and also during after-hours inspections. The entire area (i.e. lab core) is secured and inaccessible without a key, card, etc. Laboratories found with unsecured RAM are issued a violation. If three such violations are issued within a 12-month period, the lab can lose its privilege to receive and use RAM. Although there aren’t specific requirements for most chemical or biological agents, ensuring that your laboratory is secured against unauthorized access to these materials is strongly recommended. If you have any questions pertaining to security requirements for RAM or other potentially hazardous substances, please contact Laurie Scholl (353-5389) or email: laura-scholl@uiowa.edu. During the 2016 annual hood testing EHS will place signs on fume hoods that have been determined by FM to be decommissioned or removed from service. Annually, EHS will verify the presence of each hood and that the proper signage is posted, but will not test any such listed hood unless notified by FM of a change in its status. In addition, during the annual testing, FM will be notified about any hoods that don’t appear to be in use, and FM staff will work with the department to determine if the fume hood should be decommissioned or marked as removed from service. Keep everything at least six (6) inches inside the fume hood. Why? Drafts and eddy currents within this zone can pull vapors out of the hood. Run electrical cords under, not over, the front airfoil. Why? Cords create further air turbulence and prevent the sash from closing fully. Do not block the rear exhaust slots. Raise bulky equipment off the work surface. Why? Blocked slots disrupt air flow, creating turbulence and allowing exposure to users. Close the sash when the fume hood is not in use. Why? The sash can work as a blast barrier or fire containment for experiments gone awry. Additionally, each hood uses as much energy as a house. Closing the sash can save energy and money. Your EHSA account authorizations need to be updated. Contact Rachelle Justice or Jeff Montgomery (rachelle-justice@uiowa.edu, 353-4692 or jeffrey-montgomery@uiowa.edu, 335-7964). If you find abandoned chemicals from previous room owners and wish to dispose of them, contact Tim Weber for a “lab clean-out” (timothy-weber@uiowa.edu, 335-4626). If you find abandoned chemicals from previous room owners and wish to keep them, contact Rachelle Justice or Jeff Montgomery. They can add these chemicals to your EHSA account for you. BB,BSB,CBRB, MERF, PBDB, CB, HLI, IATL, SC, WP & all other areas.